This was one of the 1915 movies I wanted to make sure and see before finalizing decisions on the Century Awards for 1915. I would have preferred to watch it closer to Halloween and my history of horror, but it took this long for me to procure a copy and find time to watch it. Henry B. Walthall (who played the lead in “The Avenging Conscience,” another Poe adaptation) plays Edgar Allan Poe in a combination bio-pic and illustration of his most famous poem. It begins by showing his ancestors arriving in America, fighting in the Revolution, and performing on stage. Poe the boy is orphaned at an early age and sent to live with John and Francis Allan in the South. He grows into a young man with a taste for wine and many debts, and is sent home in shame from college. After one bout of drinking, we see Poe dreaming of killing a man in a duel with pistols. Poe meets Virginia Clemm (played by Warda Howard, who was 35 at the time, rather than the 13 or younger Clemm was when Poe met her), and the two spend a romantic day riding together in the woods and sitting beneath a tree. Poe spins a story about the two of them as Robin Hood and Maid Marion, with fairies dancing around them, and a raven sits momentarily on his shoulder. On the way home, they encounter a man beating a slave (Bert Weston in blackface), and Poe writes him an IOU to buy the slave and save him from cruelty. Allan is furious at Poe for taking on further debt and shames him in front of Virginia. There is then a brief rivalry between Poe and his friend Tony over Virginia, but she clearly prefers Poe and he “wins” her hand at a fixed game of chance. Poe, Virginia, and the slave leave the Allans’ home at John’s request. …Suddenly there came a tapping/As of someone gently rapping/Rapping at my chamber door. The movie now shifts to Poe, alone in his quarters, drunk on wine and the recreation of “The Raven” begins. Intertitles recite most (though not all) of the stanzas, and Walthall acts the situation out with a large bird. Other fantasy sequences are added as well. At one point, he sees himself progressing up a mountain, stumbling when he reaches a large rock labeled “wine.” The image of Virginia appears and beckons him, and he climbs over the rock. Later, trying to drink from his wineglass, it turns into a human skull in his hand. 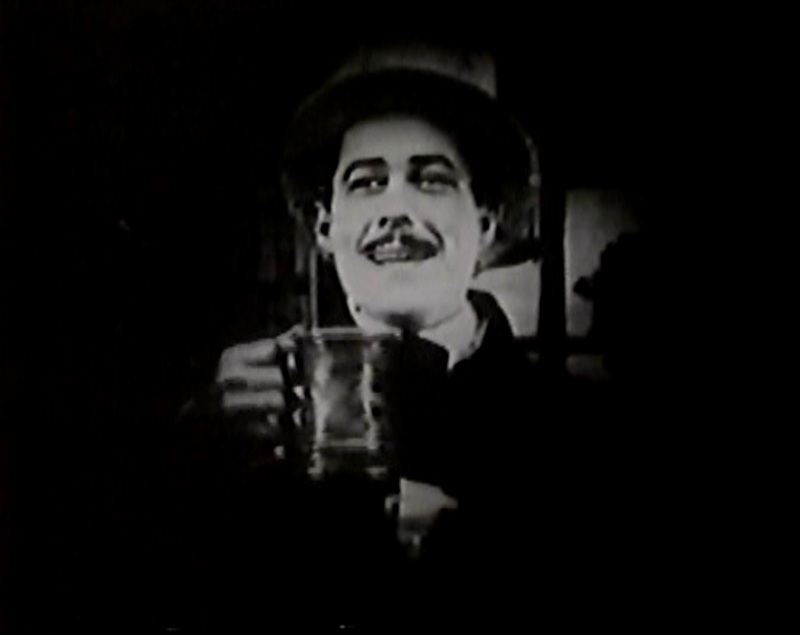 The raven, of course, spreads its message of doom in oversized letters on the Intertitles. 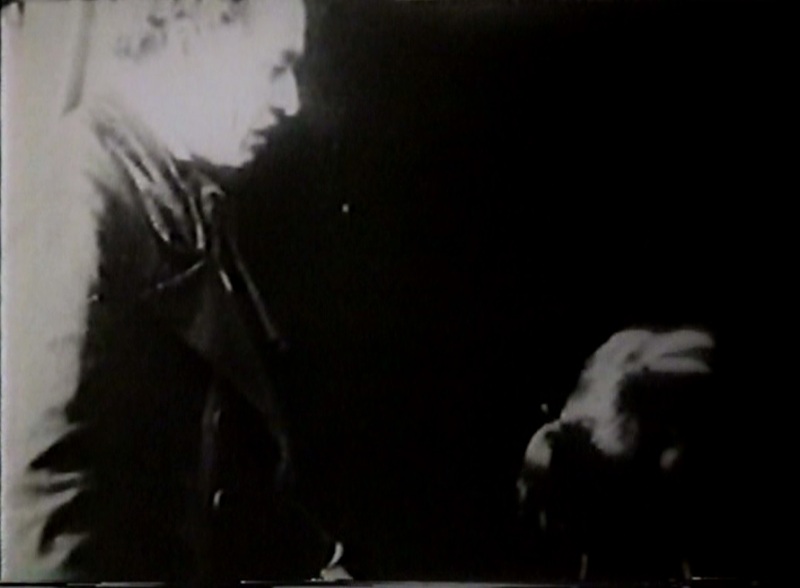 The final section of the film shows the death of Virginia and Poe’s descent into despair. Warda Howard appears again in the role of Sarah Helen Whitman, tending to an old couple, but the scene in which Poe dies while on his way to see her is missing from this print, or perhaps it was never shot, leaving a somewhat confusing resolution. This movie, made late in 1915, includes many of the technical advances that became common in that year. We’ve got tracking shots, and other camera movements (even re-framing when new actors enter a shot was radical the year before! ), a good number of close-ups, and cutting within scenes to punch up dramatic moments. Walthall makes a good Poe, as many critics commented at the time, and he handles the tragic moments well, showing agony without overdoing it in close-up. Unfortunately, the surviving print is very washed out, making faces frequently hard to discern, and background details almost completely obscured. I was warned about this, by The Silent Era among others, so I have no one but myself to blame, but it’s too bad this movie hasn’t been considered important enough to get a good remastering and re-touching. The big problem for me in the end was the story. There’s basically two acts of Poe’s life, told fairly accurately but without any clear resolution, with a filmed version of “The Raven” sandwiched in between for no reason. As I so often do with this era, I found myself wondering whether the filmmakers wanted to make a horror movie or not. 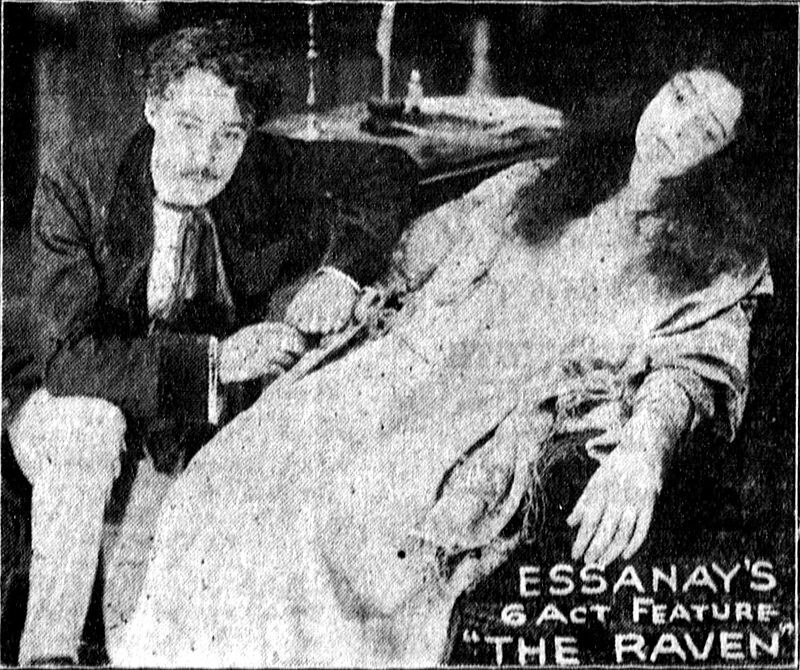 The raven sequence has horror elements, but it also has no clear connection to the plot, unless the whole thing is an alcohol-induced hallucination. Poe hasn’t even lost Clemm at this point, so there’s no reason for all his lamenting about Lenore already. In the end this was interesting, but not what I’d hoped for. I have not been able to find this for free on the internet, if you do, please let us know in the comments.